Exclamation de Coty Eau de Cologne Spray 50ml . Coty Exclamation Eau de Cologne 50ml Spray - For Her. The differences are the amount or the concentration of oils that are in the scents. The higher the concentration of oils, the longer your scent will last, and the less you should need to apply. EXCLAMATION COLOGNE SPRAY 50ml Producer: COTY. Not only pleasant and very feminine, but also a very durable fragrance with a crowd of female fans. Marke Exclamation. Serie Exclamation. Produktart Eau de Cologne. Maßeinheit 100 ml. Una colección de bienes queda excluida. Exclamation Blush by Coty for Women Cologne Spray 50 Ml. There is no cellophane in the box. Little scratch on box. 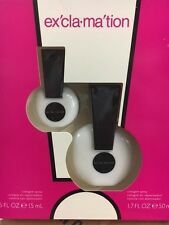 Exclamation Gorgeous by Coty Eau de Toilette Spray 15ml There is no cellophane in the box. Coty Exclamation Gorgeous is a fresh and romantic floral - fruity fragrance for women. Coty Exclamation Eau de Cologne 50ml Spray. Este artículo se vende con el 22% de IVA incluido. Productos indicados como "Para desguace o que no funciona " se venden "tal cual",sin ningún tipo de garantía. Coty Exclamation Eau de Cologne donna 50 ml | cod. Coty Exclamation Eau de Cologne 50ml Spray. Garanzie e Restituzioni. [A bouquet of flowers that is warm and a little bit spicy to allow you a wonderful experience.]. [Cologne Spray 1.7 oz]. Il prodotto non deve aver subito alcuni tipo di alterazione. A bouquet of flowers that is warm and a little bit spicy to allow you a wonderful experience. You are running a high risk of losing the case if no sufficient evidence is provided. The photos are used for illustration purposes only. Coty Exclamation Cologne Spray 50 ml. Fragrance by the designer house of Coty. A floral fragrance. Need Help ?. A bouquet of flowers that is warm and a little bit spicy to allow you a wonderful experience. ítica de Privacidad Cambios a la Pol. Cookies son archivos que contienen pequeñas cantidades de data, que pudiesen incluir identificadores únicos anónimos. Exclamation by Coty Eau de Cologne Spray 50ml . Eau de Cologne. Eine Abholung der Ware ist ausgeschlossen. Exclamation Cologne Spray 50ml. A fresh crisp & oriental scent with magnetic appeal. This item is coming from our US warehouse. Exclamation Perfume for Women By Coty 2 Pc. Set NEW. GIFT SET ( COLOGNE SPRAY 1.7 oz / 50 ml COLOGNE SPRAY 0.5 oz / 15 ml ). PRICE IS FOR ONE SET. Eau de Cologne Coty Exclamation 50ml. Toutes nos expéditions sont faites avec uneméthode traçable. SIZE: 1.7 OZ = 50 ML EACH. For USA only! NO USA CUSTOM FEES. COTY EXCLAMATION WYKRZYKNIK 30ml unbox DE2579507592399-V.
Coty Exclamation Eau de Cologne 50ml Spray. Diese Gebühren sind die Verantwortung des Käufers. Der Käufer ist in keiner Weise ablehnen, ein Produkt zurückgeben, wenn er bat um Verkäufer die Reparatur. Coty Exclamation Eau de Cologne 50ml Spray. 100% authentic, new and sealed product. Products stated as "For parts or not working " are sold "as is " without any warranty. Doing that is against U.S. and international laws. Exclamation 1.7 OZ / 50 ML. SIZE: 1.7 OZ = 50 ML. this sale ONLY for 1 bottle. Duftrichtung: blumig, fruchtig Kopfnote: Aprikose, Bergamotte, grüne Noten, Pfirsich Herznote: Heliotrop, Iriswurzel, Jasmin, Maiglöckchen, Rose Basisnote: Amber, Moschus, Sandelholz, Vanille, Zeder, Zimt Das Parfüm Coty Exclamation eignet sich ideal für die Freizeit. 0.5 OUNCE. NEW IN BOX. ITEM : (1) Exclamation Fragrance Set. Exclamation Fragrance Set. 2pc Spray Bottle Set. If an item was unintentionally misrepresented or a mistake was made on our part, we will make it right! If the candy has softened, give it a chance to firm up before handling further. Exclamation by Coty Mini Cologne en Vaporisateur Spray for Women .375 oz NEW NIB. ITEM : Cologne Spray.37 fl oz / 11 mL to. 375 fl oz / 11 mL. ITEM CONDITION & PHOTOS If an item was unintentionally misrepresented or a mistake was made on our part, we will make it right! EXCLAMATION COLOGNE SPRAY. BY COTY US NY. ORIGINAL FORMULA VGC.